Speedy the cheeky house bunny: Artsy Saturday and Sepia Saturday a bit of fun! Artsy Saturday and Sepia Saturday a bit of fun! Hehehe.... anyone going to try for the reward? Don't forget you still have time to enter my ASPCA give away HERE! you have till tomorrow at midnight UK time to enter! And Athena's Caturday Art blog hop too! 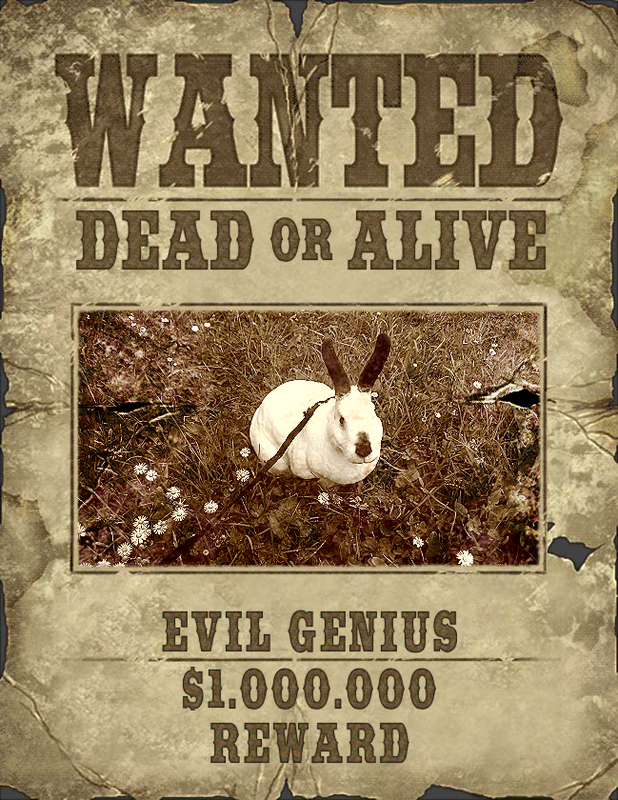 I will try for the reward, but as you are a genius, evil or otherwise, I think you will be difficult to catch up with. I'LL BRING IN THAT VARMINT alive...teeeheee....I've got 'em, I'VE GOT THE EVIL GENIUS! Great picture, Speedy!!! Have fun everyone! oh my Speedy... we didn't know you was wanted... fur being a genius! Are you an escape artist too? Do stops by and says hellos to the sweetest foster kitten... him gots sparkly hearts! Genius yes, evil no, but cute. Have a great weekend, Speedy. Wow, that's quite the wanted poster, Speedy! We hope you are only wanted alive! Can't the reward be that we get to keep you, Speedy? I wouldn't mind having myself a Speedy. Ah! Ha!!! Mes LOVES my Evil Genius! Can wes escape to your hide-a-way and snuggle! We pick the alive part :) Have a great weekend! That is really a great work of art Speedy. Whoa! My kind of bunny! You can hide out here. Oh Speedy! You could never be evil! We want you live and all your fuzzy goodness intact. Naughty but not evil!